Last ten days has seen the crude focus shift to Argentina for a multitude of reasons which may be construed as good or bad depending on your point of view. To begin with, BP’s move to sell assets in Argentina has fallen through after its partner withdrew from the deal. BP wanted to sell its 60% stake in Pan American Energy (PAE) to its partner in Argentina, Bridas Energy Holdings, which is subsequently owned by CNOOC, China's largest offshore oil producer. However, on November 6th CNOOC said it was terminating the deal, signed a year ago as BP was grappling with the fallout from the Gulf of Mexico oil spill. The stake sale was worth an estimated US$7 billion and was one of the largest sales agreed by the firm following the disaster. It is understood that BP will now have to repay its US$3.5 billion deposit on the agreement which had been contingent on regulatory approval. Barely days later, on November 8th, Spanish giant Repsol’s Argentine subsidiary – YPF Sociedad Anónima – said it had found 927 million barrels of recoverable shale oil in Argentina which could catapult the country to the energy elite league. In a statement, YPF said the discovery – located in the Vaca Muerta basin of Argentina's Neuquen province – "will transform the energy potential of Argentina and South America, boasting one of the world's most significant accumulations of non-conventional resources". The discovery is likely to give renewed impetus to the country’s creditors who have been chasing the Argentine government for almost a decade since its default in 2002. Most bondholders took part in debt exchanges in 2005 and 2010, but a brave crew of EM and NML Capital – an affiliate of Elliott management – along with a group of 60,000 individual Italian investors have been bravely holding out and using legal avenues to recoup the US$6 billion-worth of debt plus interest. They may think it’s about time the country paid courtesy of a commodities-led boom. Regrettably for YPF though, the find came only days after Moody's downgraded Argentine oil & gas companies. These included YPF, Pan American LLC, Petrobras Argentina, Petersen Energia and Petersen Energia Inversora. According to Moody’s, the ratings downgrade and review for further downgrade were prompted by the new presidential decree requiring oil, gas and mining companies to repatriate 100% of their export proceeds and convert them to Argentine pesos. Previously, oil and gas companies operating in Argentina were permitted to keep up to 70% of their export proceeds offshore. 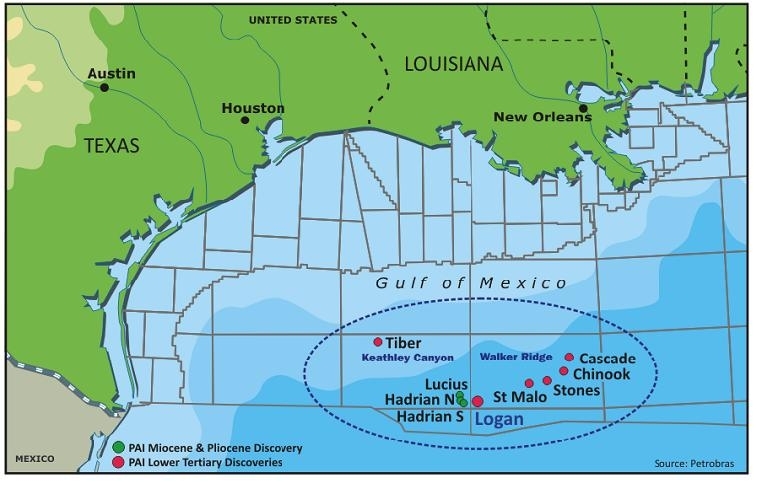 The discovery – Logan – is approximately 400km southwest of New Orleans, at a water depth of around 2,364 meters (or 7,750 feet). The discovery was made by drilling operations of well WR 969 #1 (or Logan 1), in block WR 969. Further exploration activities will define Logan's recoverable volumes and its commercial potential. Norway’s Statoil is the consortium's operator, with 35% stake. Petrobras America Inc. (a subsidiary of Petrobras headquartered in Houston, Texas) holds 35% of the stake, while Ecopetrol America and OOGC hold 20% and 10%, respectively. Petrobras holds other exploratory concession areas in this region, which will be tested later on, growing the Company's operations in the Gulf of Mexico. 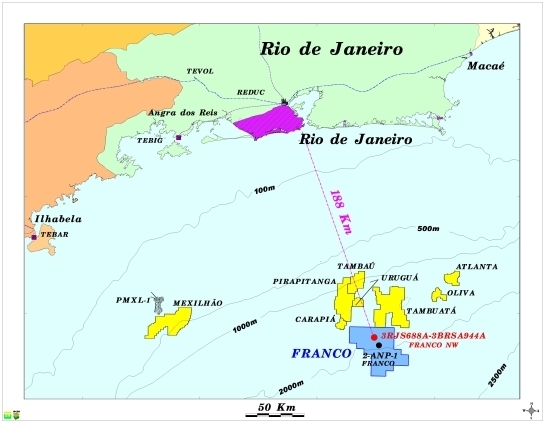 The Brazilian major is the operator of Cascade (100%) and Chinook (66.7%) oilfields and holds stakes in the Saint Malo (25%), Stones (25%) and Tiber (20%) discoveries, all with significant oil reserves in the Lower Tertiary. Additionally, Petrobras has stakes in the very recent Hadrian South (23.3%), Hadrian North (25%) and Lucius (9.6%) discoveries, all with significant oil reserves and in the Mio-Pliocene. The company has been pretty busy at home as well, announcing that the first well drilled after the execution of the Transfer of Rights agreement confirmed the extension of the oil reserves located northwest of the Franco area discovery well, in the Santos Basin pre-salt cluster (see map on the left; click to enlarge). 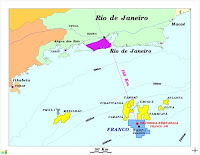 The new well, informally known as Franco NW, is at a water depth of 1860 meters, approximately 188km from the city of Rio de Janeiro and 7.7km northwest of discovery well Franco (or 2-ANP-1-RJS). The discovery was confirmed by oil samples of good quality (28º API) obtained through cable tests. The well is still in the drilling phase with the aim of reaching the base of the reservoirs containing oil. Once the drilling phase is complete, Petrobras will continue with the investment activities provided in the Mandatory Exploratory Program (or Programa Exploratório Obrigatório, PEO as it’s referred to locally). From South American discoveries to North American pipelines as it emerged last night that the Obama administration has chickened-out of making a decision on Keystone XL. Faced with the environmental lobby on one side and the Unions craving jobs on the other, the US government has requested further studies on the project which would in theory delay the decision to build the 2700km pipeline well after 2012 presidential election. Frustration across the border in Canada is likely to grow as the Oilholic noted from Calgary earlier this year. If he rejected the project, Obama could be accused of destroying jobs. If allowed it to go ahead, it could lose him the support of some activists who helped him win the Presidency. So he chose to do what political jellyfish usually do before a crucial vote – nothing. Additionally, reports surfaced earlier in the week that Houston-based Cardno Entrix – a company involved in the environmental review – had listed developer TransCanada, the pipeline’s sponsor, as a "major client". Continuing with pipelines, Moody's has assigned a Baa3 rating to Ruby Pipeline's US$1.075 billion senior unsecured notes. The senior unsecured notes have staggered maturities and will be used to refinance US$1.5 billion of project construction loans. The rating outlook is stable. Stuart Miller, Moody's Vice President and Senior Analyst, said last week that the pipeline is a strategic link that provides diversity of supply to the utilities and industrial markets in Northern California and the Pacific Northwest. "Hence, the primary drivers for Ruby's Baa3 rating are its initially high leverage tempered by a high level of ship-or-pay firm contracts with counterparties with a weighted average credit rating of Baa1 as well as our expectation that the ratio of debt to EBITDA will rapidly decline to below 4.5x," he concluded. Ruby's leverage is expected to improve over the next five years as its capital structure includes a five year amortising term loan. Because of the required amortisation, Ruby's leverage, as measured by debt to EBITDA, should decline from approximately 5.2x to less than 4.5x by the end of 2013. Any revenue earned from the 28% un-contracted pipeline capacity would reduce leverage quicker, the agency noted. Finally, Nordstream I gas pipeline came onstream earlier in the week. Here's the WSJ's Oilholic approved take on it.